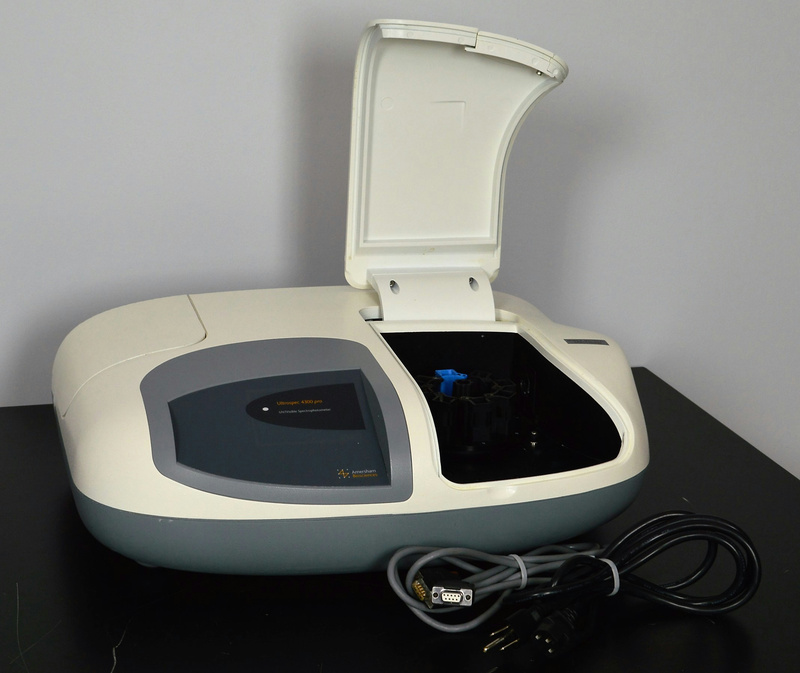 Amersham Biosciences Ultrospec 4300 Pro UV/Vis Spectrophotometer . New Life Scientific, Inc. The Ultrospec 4300 pro spectrophotometer operates in the UV/Vis range for sample applications to determine concentration, purity, and protein determination. The instrument is in good cosmetic condition, showing few signs of use or age. New Life Scientific technicians were unable to fully test the instrument, because it requires Swift II software to operate. The technicians supplied power and noticed that the UV/Vis LED flashes red twice in a sequence, pauses, then continues the sequence. There was no additional testing performed and there is no manual available. There is an eight cuvette carousel, PC cable, and power cord included with this listing.